. The Google Cloud Platform Pricing Calculator is a simple form for calculating the total cost of deploying your application on Google Cloud Platform. It currently provides lightning fast estimates for Compute Engine, Cloud Storage, and Cloud SQL. Build an estimate for your entire project in one place. Make changes and optimize the cost of your infrastructure before you even begin development. Mail out the estimate to yourself or the rest of your team. Modify your existing estimate or start from a clean slate. The Google Cloud Platform Pricing Calculator was built to make cost estimation for your next project a snap! Take the financial guesswork out of running your product in the cloud. Let us help you plan for the next phase of your application and business on Google Cloud Platform. 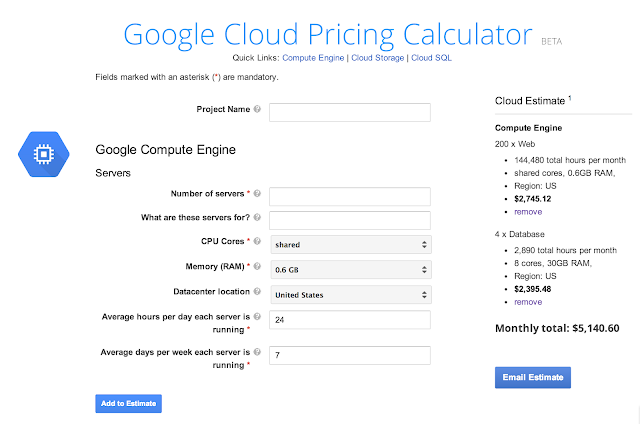 Try the Google Cloud Platform Pricing Calculator today! As a developer today, it’s difficult to anticipate your costs in the cloud. Do you have your own complicated spreadsheet to make product decisions? Would you like to know ahead of time what your new feature will cost? Today, we’re launching a solution to that problem! So, now you can find out what it will cost to launch your new application or company on Google Cloud Platform. The Google Cloud Platform Pricing Calculator is a simple form for calculating the total cost of deploying your application on Google Cloud Platform. It currently provides lightning fast estimates for Compute Engine, Cloud Storage, and Cloud SQL.